Fast-growing region 75 minutes from Melbourne. Courses include Barwon Heads, Thirteenth Beach, Sands Torquay, and more, as well as some great surf beaches. 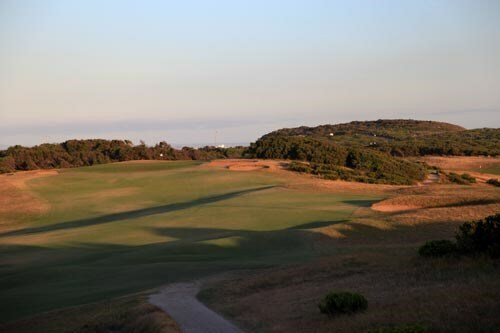 The Anglesea course is an undulating 6028m Par 73 layout. A feature of the course is the number of elevated greens that require plenty of thought when selecting your club. 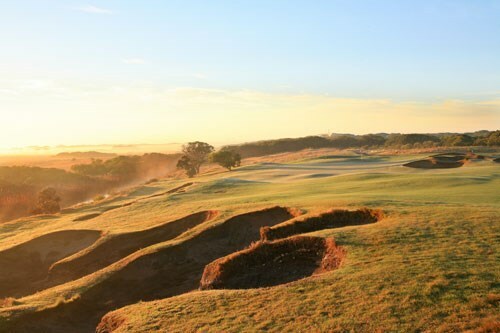 There are only 42 bunkers throughout the course which have been likened to the famed sandbelt bunkers, and coupled with the eucalypt tree lined fairways combine to produce a stimulating round. Also there is the ever present resident population of Eastern Grey Kangaroos which number approximately 300 to provide a pleasant distraction. 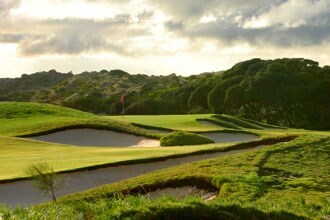 The Anglesea course is an undulating 6028m Par 73 layout. A feature of the course is the number of elevated greens that require plenty of thought when selecting your club. 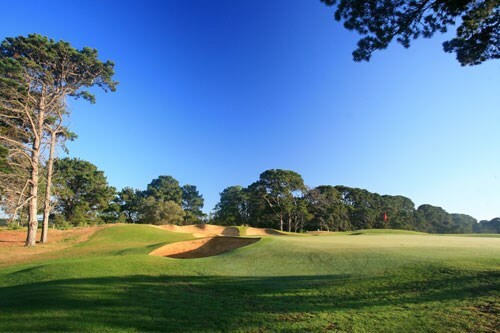 There are only 42 bunkers throughout the course which have been likened to the famed sandbelt bunkers, and coupled with the eucalypt tree lined fairways combine to produce a stimulating round. Also there is the ever present resident population of Eastern Grey Kangaroos which number approximately 300 to provide a pleasant distraction. The 2nd is a 528m par 5 that plays from an elevated tee down into a gully and back up to an elevated sloping green. Only the longest hitters can reach this green with 2 very well struck shots. The tee shot ideally should be hit down the right hand side of the fairway with a slight draw to gain maximum distance using the slope of the hole. The deep bunker on the right hand side of the green is to be avoided. After a short steep walk, the 3rd is a wonderful par 3 of 159m from the elevated championship tee. A well-struck shot is required to safely reach the smallest green on the course which is well bunkered. Once on the green, putting is relatively easy on a flat surface. An elevated tee shot awaits on the 4th hole, a dogleg left of 372m. A drive pulled to the left is better than a sliced drive as balls feed back to the fairway from the left. A short iron is all that is required for the 2nd shot to a green well guarded by 4 bunkers. Par is a good score if you find any of the bunkers, and beware of going through the green as there are rarely 4s made from there. Two well-struck shots are needed to reach the small green of the 340m par 4 dogleg right 5th hole. A drive into a narrow landing area protected by a right hand side fairway bunker at 220m from the tee is needed. A 3 wood or long iron tee shot can be used to lay up into the widest part of the fairway. From here a mid to short iron to an elevated green will be needed. If in doubt take the longer club as anything short will head back down the fairway and balls will feed back down to the centre of the green from the right if they have been hit the correct distance. Upon reaching the green beware if you have any sort of downhill putt, as they are much faster than what you may think. Take par here and go happily to the 6th. The 2nd of the par 3s, the 6th hole is slightly uphill, 176m in length. A narrow opening between the front bunkers allows you to run the ball on to the green if you are good enough. A large sloping green makes putting a difficult task. Many scorecards have been ruined at the sixth hole. The 7th hole is a bit of a sleeper and as many bogies as birdies are made here. As you stand on the tee you face what appears to be a wide driving area. At 302m it is a short dogleg right par 4, but it does require an accurate tee shot. The drive needs to be placed in the left half of the fairway to get the best line for the 2nd shot. The longer hitters can reach the fairway bunker on the right side, so a 3 wood or long iron may be a wise choice from the tee. A short iron is all that is needed for the 2nd shot which is uphill to the well-bunkered green. Best to be short of the pin here as putting downhill will cause problems. A definite birdie hole is the 8th. A short par 5 of 451m which doglegs left at around the 200m mark, you are faced with the choice of driving straight down the fairway, or if you are a longer hitter, driving over as much of the treeline as you think you can. 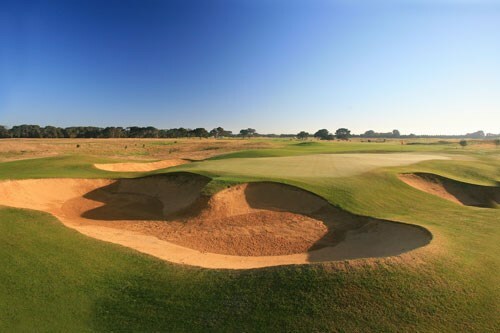 There is a sandy wasteland guarding the right hand side of the hole and a fairway bunker 220m from the tee also on the right side, both of which are visible from the tee. 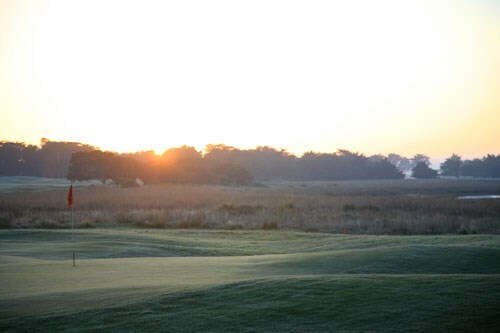 As you turn the corner at the dogleg you are greeted by a wonderful view of the shot to the green. Played through the gully the green sits atop of the rise and is guarded by 4 menacing bunkers. The green can be easily reached by a lot of players with their 2nd shots, but beware as only a well hit shot with some spin on it will hold the green. Another dogleg left waits as you complete the front nine. The 9th is a 335m par 4 with a tee shot somewhat similar to the 8th in as much as you can cut the corner over the trees by as much as you like. A drawing drive is an advantage. If you have hit your tee shot far enough you will be able to see the base of the green which makes distance judgment much easier. If not you will still be able to see the pin. A mid to short iron will be needed to reach the green which is guarded by 3 bunkers, which depending on pin positions can make par difficult to obtain. Once again a deceptively sloping green puts a premium on your putting stroke. If you are near your handicap after the front nine you have usually set yourself for a good score as the 2nd nine produces some good scoring opportunities. After completing the front nine stop in at the spike bar or pro-shop for some sustenance for the more open 2nd nine. You will need it as you go from the lowest spot on the course to the highest in just two holes. The 10th is a short par 4 slightly doglegging left hole of 292m. Played from a well-elevated tee, the green can be reached with the tee shot if the correct line is chosen. If not the gums along the left hand side will be the result if the drive is not long enough. The safer shot is to lay up with a 3 wood or long iron some 50m short of the green. From here it is a straightforward pitch to a flat green. A definite birdie hole! From the lowest point on the course the tee shot on the 11th is one of the easiest on the course. The hole is a straight uphill 334m par 4 that plays longer than its distance. You can really let rip with the tee shot to a wide-open fairway. From here a mid to short iron will be needed to reach the green. Make sure you have enough club, as anything short will come back down the hill at the front of the elevated green. The bunker at the front left of the green also needs to be avoided. Putting from past the pin is a good test of your stroke. The 12th is a long uphill dogleg left par 5 of 475m. The fairway slopes from left to right so keeping to the left side is an advantage. Beware of going too far left, as there is out-of-bounds the length of the hole on this side. Once again only the longest hitters can reach the green in two. Usually the third shot is played across or from within the valley 100m short of the green. Some precision is required as the shot is played to an elevated green that is only some 15m deep, slopes from back to front, and is guarded by a deep bunker at the front. Putting is also a test on this green. There are not too many birdies on this hole so par here is a good score. 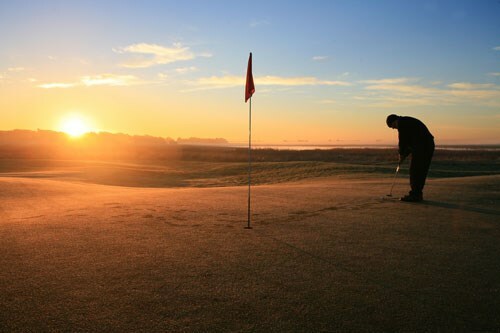 After reaching the highest point on the course, take a few deep breaths before playing the easiest hole on the course. The 13th is a 128m downhill par 3 to a smallish green that is bunkered on both sides. Only a high well-struck tee shot will hold one of the firmest greens on the course that also slopes away from you. Anything over the green usually makes par difficult. The 14th is a slightly downhill par 4 of 408m. This hole bends gently from left to right and has a fairway that slopes from right to left. Another wide-open fairway waits, and a good line off the tee is the chimneystack of the nearby power station with a slight draw to gain maximum length. A premium is put on the second shot here to a two-tiered green that when the pin is on the upper level is difficult to get close to. The green has a deep bunker on the left hand side and some mounds and swales on the right. Any shot missing this green and you are faced with a difficult task to make your par. A nice short downhill dogleg left par 4 of 348m, the 15th yields plenty of birdies. There are no bunkers on this hole to worry about. The tee shot is played over a small wetland 50m from the tees that surprisingly collect plenty of balls. The longer hitters can take on as much of the dogleg as they can to considerably shorten the hole, over the pine tree is the line. The hole doglegs at around the 200m mark from the tee and most players can reach the corner. From here it is a short iron that can be run on to a flat green. Try to avoid missing the green long or right, as chipping is quite difficult from these areas. The final par 3, the 16th is a picturesque hole of 125m that is best played from the upper left tee to fully appreciate the hole. Played across a valley to an elevated and very small green a well judged shot is required. Anything landing on the front of, or short of the green will roll well back down the hill. There is a very deep bunker on the left of the green from where 3 is very rarely made. The bunker on the right is not much better and avoid being long at all costs. Once on the green, putting is not difficult, but beware of the speed putting from the back of the green. Rated the hardest hole on the course the 17th is an uphill par 4 of 366m, with the second shot being played once again to an elevated green. A well-stuck drive can usually leave a long to mid iron second shot. There is a large bunker short left guarding the green, that can be avoided by playing out to the right as the ball will feed towards the green from this side. Once on the green you can be faced with some severely sloping putts especially in the back half. Standing on the 18th tee you are looking at one of the most aesthetic finishing holes in the district. With the clubhouse forming a background you can finish your round in glory with a birdie or even possibly an eagle. The hole is 455m in length and can be reached by many players in two shots. From an elevated tee the drive is played to a wide fairway. Depending on conditions a mid iron can be used to reach the green by the longer hitters, otherwise a 3 wood or long iron will be required. The green is elevated, and guarded by a deep bunker at the front left. There is also a bunker 50m short on the right hand side. The green has four levels that make for some interesting putting. So there you have it. After sinking your birdie putt on the 18th you can head for the comforts of the clubhouse and reminisce about your round whilst having a quiet drink overlooking the 18th green. 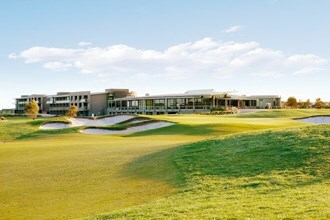 Have a bite to eat from the bistro and dont forget to watch out for the roos grazing outside the clubhouse. 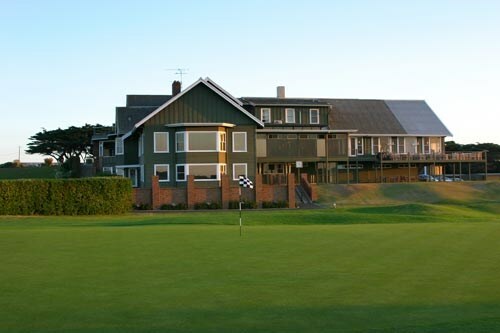 Curlewis Golf Club is located on the beautiful Bellarine Peninsula, one hour's drive from Melbourne and ten minutes from Geelong. A tight driving hole with trees left and right. Both the tee shot and second need to be left centre of fairway otherwise you may find yourself blocked by the trees lining the right hand side. The third shot is to an elevated saddle shaped green. A pitch shot landing on the front edge may well run back off the green, finishing 30 metres away at the bottom of the slope. Thick rough guards the back of the green. A tee shot of about 200M down the left side will open up the green. The temptation to fire at the green from the tee can result in problems with thick right hand rough and bunkers guarding the corner and right hand front of the green. The front two thirds of the green slope back to front and right to left, the rear third falls towards the back of the green. 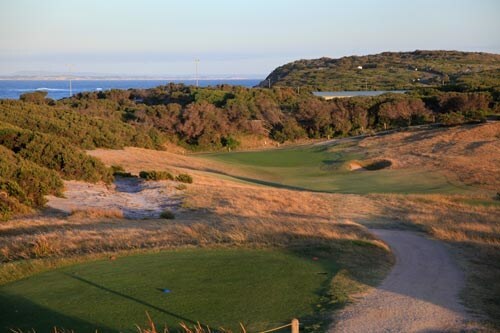 A short par four with great views over Corio Bay to the YouYangs. 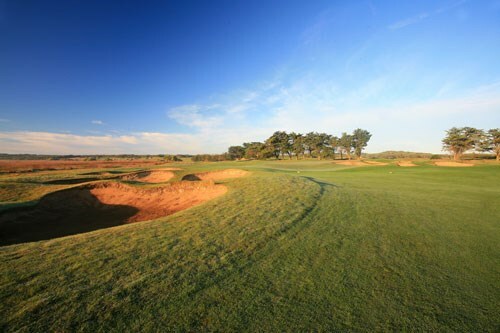 The bombers can reach the green, however, the hole's defences include out of bounds down the left, sloping rough and trees behind the green and bunkers guarding the right. The green slopes left to right and front to back. A ball finishing in the deep left hand bunker will result in a difficult sand shot with the green falling away to the right hand bunkers and should be avoided. A par three rated number one on the course. 170M long but plays anything from a mid-iron through to 3-wood depending on the breeze. Distance control is a priority on this hole, the green slopes back to front with the front right hand third sloping severely to the right ? resulting in shots landing in this zone rolling off the green by some ten or fifteen metres. If the pin is on the front half of the green shots from the left hand bunkers can prove difficult with the green falling away from you. A straightaway hole, the fairway narrows the further you hit it, trees both sides and the ground slopes to the left from the left edge of fairway. A tee shot of about 200M to the centre of fairway will provide easy access to a gently undulating green with subtle borrows. The bombers can reach the green in two with drive down the right hand side, for the rest of us, a tee shot down right centre, avoiding water 210M on the right. Care is needed with the second shot with thick trees through the corner and trees and bushes lining the right hand side. The third shot is played to a green which slopes severely from back to front. A downhill putt on this green will prove difficult. A tee shot to the top of the hill will provide a good view of the green, bombers can drive over the hill but need to keep the drive tight to the bunker on the left hand side at the top of the hill or the result will be a second from the trees on the right. As with the sixth, try to keep the ball short of the pin on the two tiered green, bunkers through the back of the green can provide for some challenging shots. A mid length par 3 protected by deep bunkers with a small green. Hit the putting surface or prepare to make bogey. Choices from the tee are to attack the corner or positional play to the right hand edge of the corner bunkers from where the ball will roll towards centre of fairway. Should you choose to take on the corner and fail, trees and heavy rough are waiting on the left and more trees on the right hand side. Positional play will leave you with a mid to short iron to an elevated sloping green. A ball played over the right hand bunker and landing outside the right edge of green and past the pin should result in the ball finding its way close to the middle of the putting surface. The green slopes substantially from back to front with some significant borrows. A straightaway par four. The tee shot is over 100M of water with a string of bunkers along the left and a tongue of rough protruding from the right at about 200M. The choices from the tee are to carry the rough or play to position leaving a mid to short iron to the pin. The green is protected by a bunker on the left front and mounds and slopes on the right. The green generally slopes from back to front and right to left . A tee shot of 220M plus, tight to the corner, will find you in good position to attack the flag, however trees and the inside corner bunker are waiting for the shot that does not quite make it. The safest line from the tee is left centre of fairway, rough on the right is to be avoided. The back to front sloping, undulating green is protected by bunkers short left and right and rough through the back. This exposed green is often affected by the wind - there are very few easy putts here. The corner of this dogleg is two shots away for all but the big bombers, the best line for these two shots is left centre of fairway. The green slopes back to front with the front left falling away to the left side, a ball finishing in the middle of the green will provide a reasonable putt to most pin positions. A long par three guarded by strings of bunkers left and right around the green, combined with an undulating green that slopes from back to front provides a challenging golf hole. A tee shot left of centre will provide an easy second shot to a shortish par five, a shot down the right faces large bunkers at 200 ? 250M and tall trees on the line to the green from there. Second shot should be positioned with a view to the placement of the pin, i.e. Position on the right hand side of fairway for a left hand pin. The green is protected by left hand bunker and severe slopes throwing the ball to the right on the right front quarter of the green. A tee shot to the right of the inside corner bunker leaves a long shot in, however water lurks behind the tree line just short of this pot. The right to left sloping green is protected by bunkers on the right front and left hand side. Middle of the green is a good option. Bombers are known to take the tiger line to the green, be aware of the danger in this shot with both scrub and water down the left, a 220M tee shot centre left of the fairway provides for a short approach to an elevated green. A tee shot pushed to the right leaves a considerably longer uphill shot over the bunker protecting the front and right of the green. A short par three requiring a tee shot finishing on the same level as the pin on this three tiered right to left sloping green. Left will find trouble with Out of Bounds within feet of the left hand bunker. A tee shot to the right centre of the green is normally the best option. Beware the downhill putt! A great finishing hole which often plays much longer than its advertised meterage due to the prevailing wind. Water left and bunkers right demand a precise drive skirting the right hand pots for the long hitters, otherwise a tee shot to the right centre of fairway will provide the best approach to a green with more water on the left and bunkers front left and curling around the front and right hand side. Middle of the green is a good option. 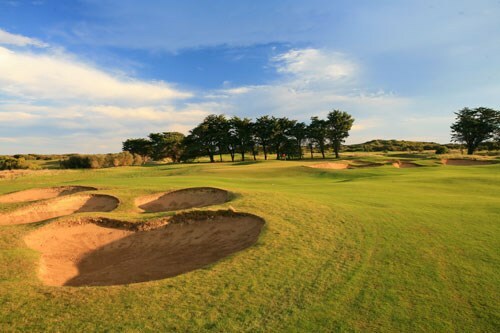 Lonsdale Golf Club is a highly regarded 18-hole sandbelt course with a varied layout situated on beautiful Lake Victoria, conveniently located in Point Lonsdale on the Bellarine Peninsula. 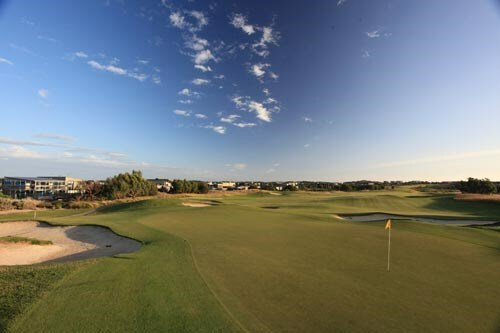 One and a half hours drive from Melbourne, the Lonsdale Golf Club course is a par 71 of 5,700 metres for men and par 72 of 5,200 metres for women. 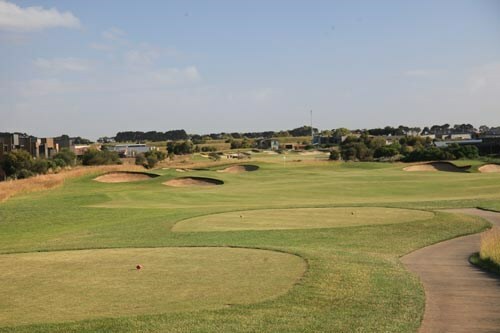 Lonsdale Golf Club is a highly regarded 18-hole sandbelt course with a varied layout situated on beautiful Lake Victoria, conveniently located in Point Lonsdale on the Bellarine Peninsula. The nearby Rip at the opening of Port Phillip Bay to the sea, is one of the Bellarine region’s many stunning attractions along with wineries, cafes, restaurants and accommodation. 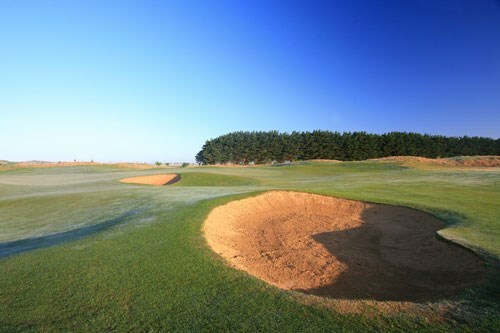 One and a half hours drive from Melbourne, the Lonsdale Golf Club course is a par 71 of 5,700 metres for men and par 72 of 5,200 metres for women. 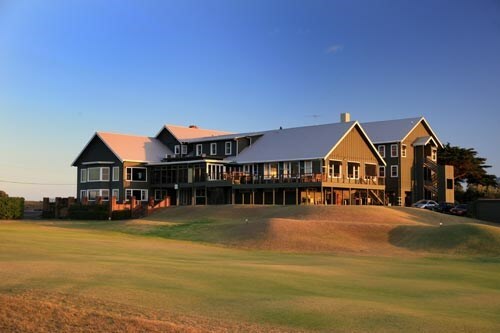 Port Fairy Golf Club is a magnificent course that also doubles as one of the great coastal walks in Victoria and is just a few kilometres from one of the states most desirable seaside retreats, Port Fairy. 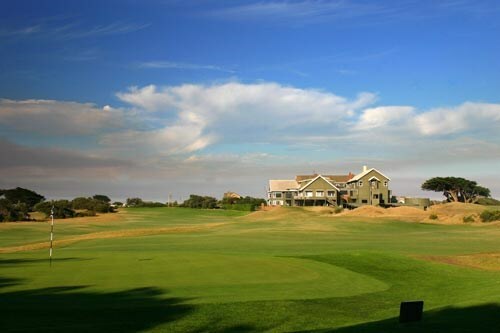 Set in towering linksland overlooking the Southern Ocean it enjoys cult status among true golf nuts for its formidable challenge but it's difficult to get too upset about bad shots in such an awesome location. 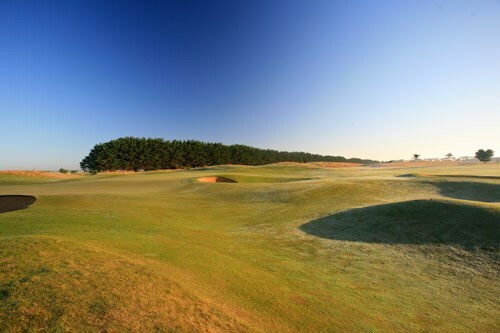 The gently rolling sand dunes of Port Fairy Golf Club have been largely unaltered by man, only mown in order to define fairways and rough giving rise to a wonderful natural 'feel'. 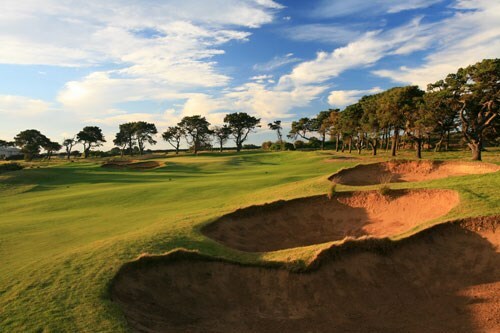 Golf at Port Fairy is typical of the great Scottish courses, such as St Andrews, Troon and Carnoustie. 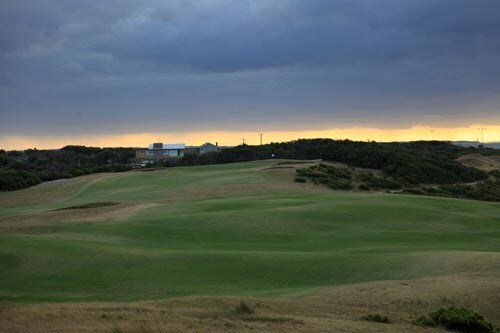 Consistently ranked within the '25 Best Public Access Courses in Australia' this classic links style course winds its way through unspoilt sand dunes and provides spectacular views of the Southern Ocean. 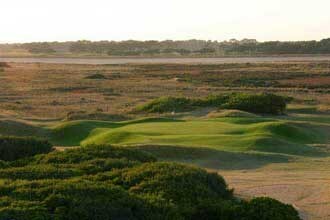 Those familiar with the golf course at Port Fairy will know that it is a precious and unique layout. 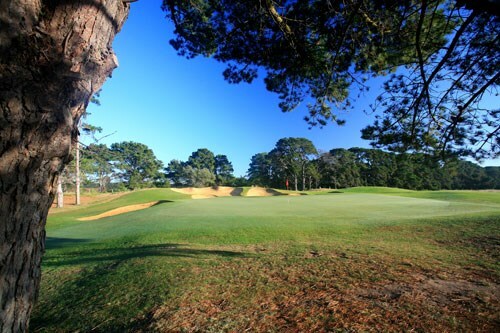 Nowhere else in Victoria is golf played so close to the ocean or along dune land of such quality. A truly wonderful and unique experience will be had by golfers of all ability. A good length par 5 dogleg running left to right, a well positioned drive down the right hand side will give the big hitters a chance to go for the green in two. Lovely undulating par 4 over the hill to an elevated, fast green; bunkers right front of green and left back. A short but difficult par four with lots of danger down the left and a couple of well placed bunkers guarding the green. A testing well bunkered par three. A first class par five with a beautiful undulating fairway, wide enough to make it strategically interesting. There is danger on both sides of the tee, then sweeping right uphill to a perfectly placed fast sloping green. Danger to the right off this tee characterised by the heavily banked dune so keep to the left. The second shot is to a relatively small green with very subtle slopes. Medium length par four dogleg left to an elevated green. Downhill par three with a devilishly fast steep green surrounded by deep bunkers. Wind strength and direction can make this hole a significantly daunting prospect. The most difficult hole on the front nine. This is a very good par four moving from left to right back to the Clubhouse. One of my favourite holes. A straight par four slopes from left to right to a back to front sloping green. Terrific par three with great views off to the right. A very simple straightforward par five the only hazard being the out-of-bounds line to the right. Views from the tee one of the most stunning in Australian golf, this hole skirts the Southern Ocean from tee to green. Superb views back to Port Fairy and the lighthouse. Note: On this hole, the 14th, 15th and 16th you may be lucky enough to see dolphins frolicking offshore or even the majestic Southern Right Whales that visit our shores during their calving season between May and September. Short par four with the fairway sloping sharply from right to left. Best to keep as far right as possible off the tee. This is the most challenging hole on the course with out-of-bounds on the right; the second shot is made difficult by the wind coming off the sea to the right of the green. Spectacularly framed by the ocean this long par three is a wonderful hole to play. It leads to a sloping green which is very difficult to read. A sweeping dogleg left this par four has a blind tee shot with the second shot to the green made more difficult by a sloping elevated green. Medium length par four over the hill with out-of-bounds close to right hand side of the fairway. Bunkered right and left of green. Mens longest par five. 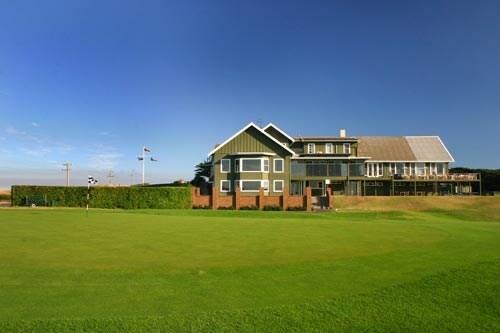 Position your shot to the right for the best angle to the green in front of the Clubhouse. 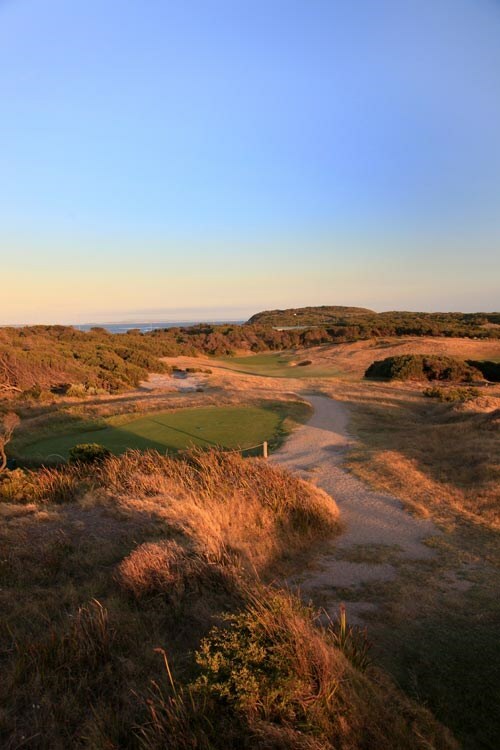 Less than 5 years ago the area known as the Bellarine Peninsula, Surf Coast and Shipwreck Coast was more well known for its surf beaches than its golf courses. 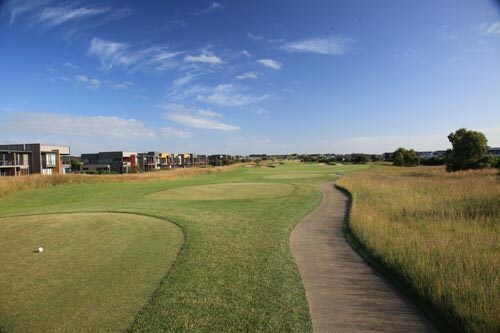 Starting 65 minutes southwest of Melbourne (and just beyond the city of Geelong) this area has grown significantly in golfing terms with the addition of a large number of new courses. 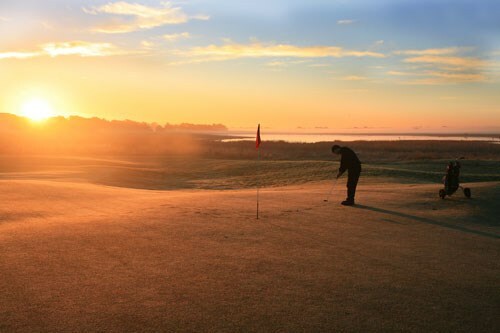 This region is an ideal self drive location where you start at the beginning of the Peninsula and over 2 to 5 days can meander your way through series of new and well established courses—each offering different golfing challenges. Starting on the other side of Geelong the little coastal town of Barwon Heads is home to three courses worthy of playing. 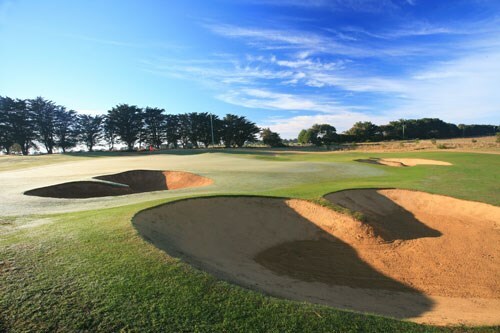 Barwon Heads Golf Club is a private member's course offering limited non member access through GOLFSelect and contains a series of holes that Tom Watson, amongst others, has heaped high praise upon. The wind is a constant companion at Barwon Heads and the encroaching tee tree on many of the holes will catch errant tee shots. 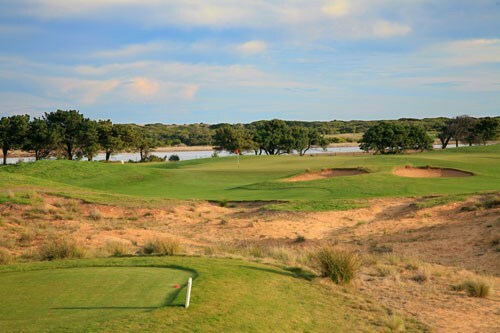 Barwon Heads is probably most famous for its 13th hole—a 130m par 3 with a postage stamp size green and severe contours which feed the ball off the green if not struck perfectly. 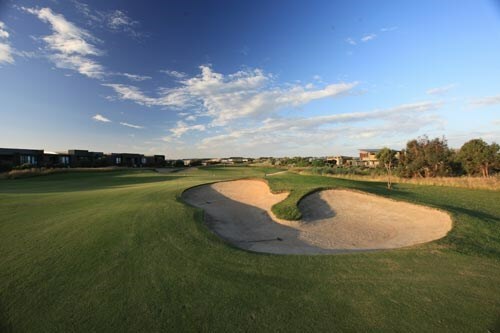 From the 13th tee at Barwon Heads the golfer can stare across open grasslands to Thirteenth Beach Golf Links - a new 36 hole golf development with courses by Tony Cashmore (Beach Course) and multiple major winner Nick Faldo (Creek Course). 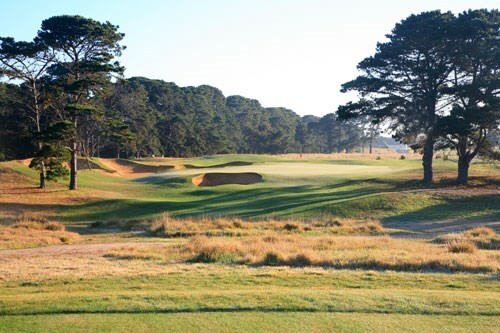 Similar in topography to Barwon Heads the Beach course offers many comparable challenges and belies its age in terms of the course maturity. The Creek course has also matured over the last few years since its opening and provides a nice companion for its sister course. Heading further down the peninsula lies the sleepy surf coast town of Torquay which until recently was famous for its hosting of many professional surfing events. 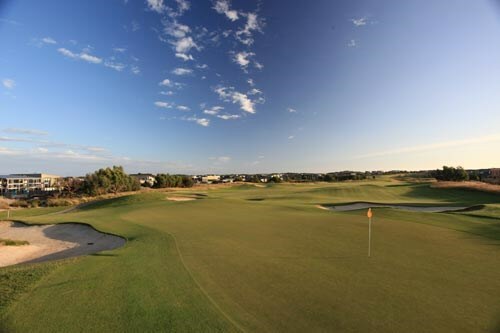 Stuart Appleby (Top Australian golfer) has put his design stamp on a new course known as The Sands - Torquay. Built right up against the ocean it offers a rugged set of holes with perfect fairway conditioning, cragged shaped bunkers and true greens. Twenty minutes down the road from Torquay lies another surf town - that of Anglesea. 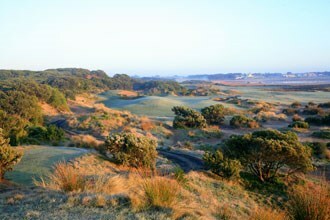 The golf course at Anglesea is nothing special in terms of golf architecture. 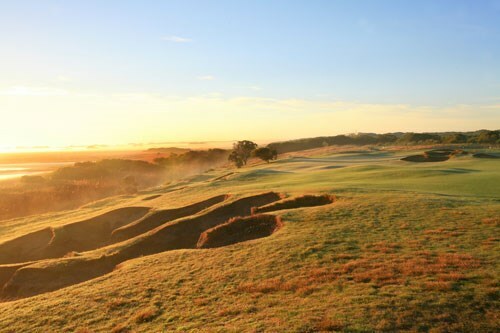 What sets this course apart from anything most visitors outside of Australia are unlikely to have experienced is the proliferation of kangaroos which are a constant companion on the golf course. The kangaroos are in their hundreds and are quite used to dodging the wayward shot that does not quite hit its target. Further down the road a couple of hours lies the main Western District township of Warrnambool. Situated on the coast this thriving country town offers the chance to stock up on needed supplies before continuing onwards. 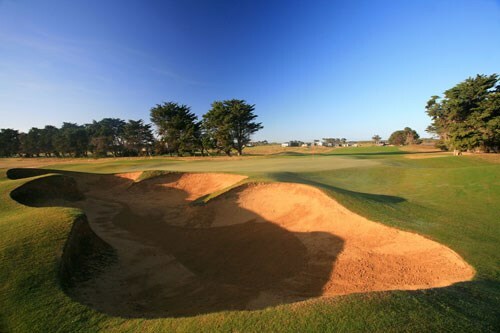 Warrnambool Golf Club is a well regarded course in this region and the combination of tee tree lined fairways, natural sand bunkers and a friendly all round feel to the place makes it a course worth visiting. 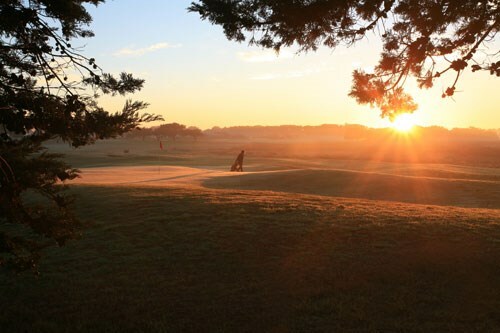 A short 20 minute drive from Warrnambool lies the sleepy town of Port Fairy - a quaint fishing town which hosts an annual folk festival, has some cosy bed and breakfast accommodation and is home to Port Fairy Golf Club, a golf course located on the edge of the water well worth playing. 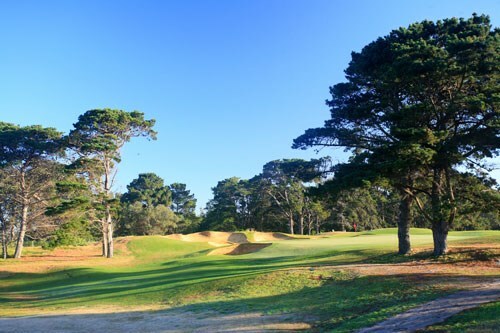 The ocean views afforded on a number of the holes (12,14,15,16) are worth the inexpensive green fee alone and the work being done on this course will ensure it only gets better over time. 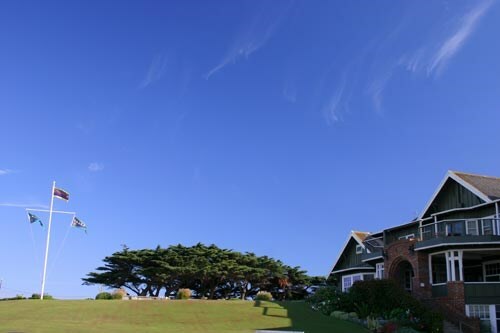 The Bellarine Peninsula, Surf Coast and Shipwreck Coast is only getting better and this well kept secret is now becoming more and more well known. It is certainly worth a visit. 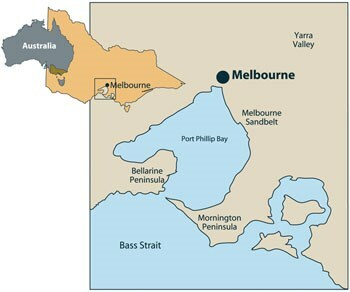 Below are some useful facts and figures for the Bellarine Peninsula Region. Use these to work out the best time to visit this region.